Here is another one just opening. CJ's is by far the best. This isn't too bad. Interesting markings. Ok. Can't load the big file so this is the small one. Something with tapatalk. But at least this will post :-). First bloomer. Great neat pattern here. 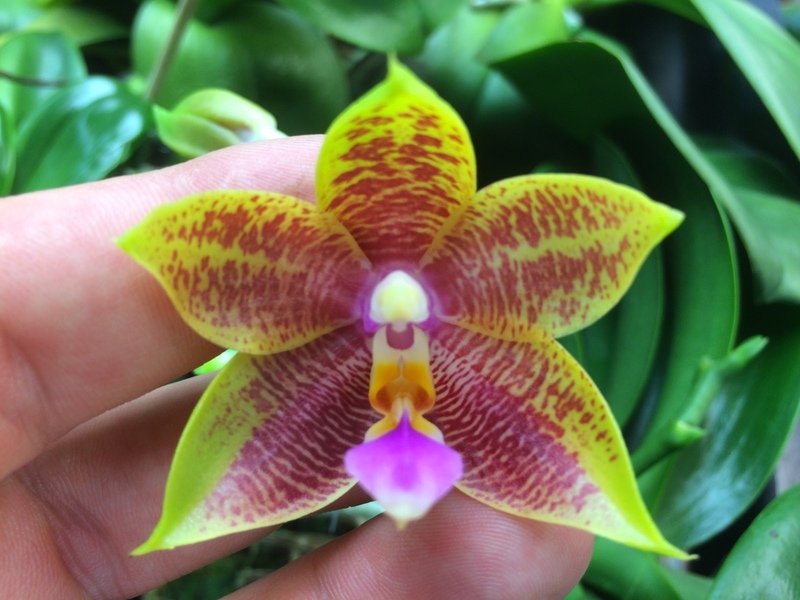 Color is a reddish orange on top half and purplish red on the lateral sepals like Bellina. Cool good formed flower it looks like. Looks like a winner. I like the yellow lines that radiate out from the center on the petals. Updated photo. Great color, nice fragrance, and a good sized bloom. Great work Peter. New pic of mine 'Starburst'. Color is nice and a light fragrance. Nice Jarad. Thanks for the update. Many years later, I found this little struggling plant putting out this colorful flower. Not bad, I like it. will keep it around for another year or two.